Barn owls have asymmetrical ears and can locate the sound of prey horizontally and vertically in total darkness. Current research since the 1970's believes that horizontal location cues came from time and vertical from intensity differences as sensed by the owl's ears. In 1994 I challenged the view that intensity differences played any part in sound location and reported statistical evidence that points to time differences as the cues to both horizontal and vertical locations. Article submission for publication in a peer review journal was not accepted. 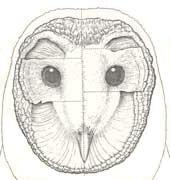 Changing the basis of sound location from time to intensity differences suggests major physiological alteration, yet a rudimentary examination of the owl's facial anatomy shows that there are only minor differences with other animals and those differences probably relate to the acoustics of sound rather than sensing intensities. This prompted me to suggest an alternative dual-tone model where low frequency ITD cues lead to horizontal location and higher frequency cues support vertical location. On inspecting the facial dimensions of the owl, one can deduce approximate frequencies: below 5KHz for azimuth and around 7KHz for elevation cues. Research literature is oriented to testing single tone, not dual-tone model such as suggested; I surveyed over 50 articles before I found published data with sufficient details for re-analysis. An ideal test would be to generate ITD from Dual Tone Multiple Frequencies (DTMF) sound, much like the sound of pressing numbers in a telephone pad, such stimulus was never reported in testing the owl's sound location. Data from a 1989 paper* illustrates how testing the current model obscures evidence for ITD elevation cues. Here, ITD cues correlate with azimuth by a coefficient of 0.98, see Fig. 1 below. The circled point is considered a "freak" result, it was ignored by all analysis. Fig. 1 Owl's horizontal (azimuth) head turns with time difference. Correlating the above ITD cues with elevation gives a coefficient value of only 0.002 according to the paper. The stimulus used was a narrow band sound with some excursion between high and low frequencies, the published data was matched between stimuli and azimuth-elevation responses, it allowed for a limited re-examination. The horizontal cues were statistically removed from the original data, the residual ITD was correlated with the owl's head turns. If the residual ITD contained no elevation cues then we would expect the head turns to scatter evenly, this was not the case. The elevation head turns had 0.35 correlation coefficient with residual ITD, see Fig. 2, and the scatter suggests that a link could be even higher for some points which align more closely to a straight line. Fig. 2 Owl's vertical (elevation) head turns with residual time difference. I suggest that using DTMF stimulus will show that the owl's elevation head turns are correlated with high frequency ITD's. * Moiseff, A. 1989a. Bi-coordinate sound localization by the barn owl, J. Comp. Physiol. A, 164 : 637-644.